We’d love your help. Let us know what’s wrong with this preview of Hellhole Awakening by Brian Herbert. In this exhiliarting sequel to Brian Herbert and Kevin J. Anderson's Hellhole, the stakes on planet Hallholme have been raised to new heights. After declaring his independence from the corrupt Constellation, rebel General Adolphus knows the crackdown is coming. Now he needs to pull together the struggling Hellhole colony, the ever-expanding shadow-Xayan settlement, and his In this exhiliarting sequel to Brian Herbert and Kevin J. Anderson's Hellhole, the stakes on planet Hallholme have been raised to new heights. To ask other readers questions about Hellhole Awakening, please sign up. Don't you just hate it when a book has an out-of-this world premise, but fails miserably when it comes to explaining and using the world and futuristic abilities that they have to the fullest extent? I am really astounded that the authors did not try (if they did, they, again, failed miserably) to expound on their previous book, pulling the reader in and giving them their well-deserved reward of having some story-lines wrapped up and handing out some conclusions to some cliffhangers. The dialogue Don't you just hate it when a book has an out-of-this world premise, but fails miserably when it comes to explaining and using the world and futuristic abilities that they have to the fullest extent? The dialogue is VERY repetitive. If you like talk-fests, then you may like this read. To be honest, this is not a "good" read. It's a convoluted mess that I forced myself to finish in the hopes of a spectacular breakthrough. No luck. I listened to the audiobook which I borrowed (thank goodness) from the library. All the five and four star reviews for this book sound like publisher's blurbs. I think the publisher or authors must be seeding the reviews. I read the first one because I liked the Dune books by these two, but I was very disappointed by Hellhole and Hellhole: Awakening. The characters are one dimensional, with cheesy dialogue and no real sense to their actions. The authors tell us what everyone is thinking (over and over and over again) so there are not many surprises in the book. All the chara All the five and four star reviews for this book sound like publisher's blurbs. I think the publisher or authors must be seeding the reviews. I read the first one because I liked the Dune books by these two, but I was very disappointed by Hellhole and Hellhole: Awakening. The characters are one dimensional, with cheesy dialogue and no real sense to their actions. The authors tell us what everyone is thinking (over and over and over again) so there are not many surprises in the book. All the characters seem really stupid at times, and their reactions to events are only to forward the plot, even at the expense of previous (meager) character development. I was also annoyed throughout the first half of the book by the constant repetition, driving home stuff that was in the first book, in case I hadn't read it. (Ishop's need to redeem his noble name, the Xayan's wish to have more slickwater converts, the Diadem is a ruthless old ruler, yeah, we get it). That kind of stuff is boring. The science doesn't really make much sense. I mean, the book states that you can 'detach' from a stringline anywhere along the line, as Walfor did coming into the Candela system when he found the doomsday asteroids, but the fleet destroys the endpoint terminus ring in a system in order to keep the rebels from entering that system. Wouldn't the rebels just hop off early to get in to that system? And ships on the stringline run off the end where the line was breeched by the rebels and get horribly lost in space, but they are able to send a probe out on the stringline which returns quickly and lets them know the line is broken? The stringline technology seems to work only as plot necessities dictate, with no consistency to speak of. And with space ships that have the power to evacuate near 300,000 people from a planet, they don't have the technology to divert two asteroids from a planetary impact with a weeks notice? HELLHOLE ended with a declaration of war with AWAKENING set up for a large scale confrontation between the Crown Jewel planets and the deep zone planets. Diadem Michella, Escobar Hallholme, and Ishop amongst others against General Adolphus and his alien Xayan race is epic within itself yet the added mystery of an anonymous space craft scanning Hellhole and the planets’ slow awakening added even more drama and chaos. There’s a lot to take in, and to the authors credit, they make it easily readabl HELLHOLE ended with a declaration of war with AWAKENING set up for a large scale confrontation between the Crown Jewel planets and the deep zone planets. Diadem Michella, Escobar Hallholme, and Ishop amongst others against General Adolphus and his alien Xayan race is epic within itself yet the added mystery of an anonymous space craft scanning Hellhole and the planets’ slow awakening added even more drama and chaos. There’s a lot to take in, and to the authors credit, they make it easily readable. This is one sci-fi series reader can enjoy rather than have to work to read. Much like HELLHOLE, book 2 of the trilogy, AWAKENING doesn't give full closure to the story arc. Whilst I walked away satisfied, I would've liked less of a tease for the next installment and more of a clear ‘end point’ to the book. Perhaps it’s more a criticism of my own impatience rather than the authors themselves – they have me craving what happens next. Mission accomplished in that respect. Like with true 2017 fashion, this is what I get for letting my 5 year old randomly pick books for me from the library. I'll be gracious and leave off any rating here. Needless to say, I'm flagging as abandoned for a reason. I will say this: I've read plenty of trashy sci-fi in my day. And even most of the trashy sci-fi sequels that I read could stand on their own in at least a minimal capacity. This one was an obvious sequel from the first page, and was consequently stillborn in my eyes. 3.5 stars. This book was better than the first one, it flowed better and the characters felt more interesting. I probably would have given it four stars if it was more in my area of interest, it was just a bit too political and military for me, but that's just a matter of taste. There were a few issues though. Some of the sections got very repetitive; Ishop repeated his issues over and over again, and we saw Bolton's history with and concern for Keana too many times, as a couple of examples. And 3.5 stars. This book was better than the first one, it flowed better and the characters felt more interesting. I probably would have given it four stars if it was more in my area of interest, it was just a bit too political and military for me, but that's just a matter of taste. There were a few issues though. Some of the sections got very repetitive; Ishop repeated his issues over and over again, and we saw Bolton's history with and concern for Keana too many times, as a couple of examples. And the heavy foreshadowing about the enemies of the Xayans that everyone kept ignoring was pretty annoying. Pretty good story overall. Slower beginning, much more interesting in the second half. Some characters have great importance in the first book, and parts of this book, and then are fairly abandoned as their relevance to the plot wanes. Lots of repetitive moments and reflections. If you haven't read the first book, you aren't missing anything because just about every plot point from the initial story is covered again...and again...and again in this book. I hope the third book doesn't do that. I will pick this one up on March 26. I am currently reading the first one in order to catch up with what is going on Hellhole. I finished this one last night. I was not ready for it to be over. The writers differently need to RIGHT FASTER!! With more action, more drama, more compelling schemes and juicy drama, Hellhole Awakening cranks things up a notch for an explosive journey. As the second book in the trilogy, I was prepared to expect another fun adventure, but I was pleasantly surprised with how the plot moved forward with grander schemes and richer characters. There were some moments in this book where I laughed out loud, raised my first in triumph, or stared at the page in disbelief. Hellhole Awakening proves that this series With more action, more drama, more compelling schemes and juicy drama, Hellhole Awakening cranks things up a notch for an explosive journey. As the second book in the trilogy, I was prepared to expect another fun adventure, but I was pleasantly surprised with how the plot moved forward with grander schemes and richer characters. There were some moments in this book where I laughed out loud, raised my first in triumph, or stared at the page in disbelief. Hellhole Awakening proves that this series is not one to be trifled with. This is a tale that not only promises great things, but delivers. One of the highlights in the story was the retired Commodore Percival Hallholme. In the first book, Hallholme was initially painted as a despicable, honorless character. At the very beginning, Hallhome tricks General Adolphus and crushes his rebellion by holding hostages on his warships. Yet there were some moments later in the story that began to shed a softer light on the commodore. Hellhole Awakening carried on the thread and managed to turn Hallholme into a somewhat tragic character you couldn’t help but like a little. Portrayed as the old warhorse brought out of retirement for a rematch, I was looking forward to seeing him in action again. While I might not have wanted him to be victorious, he was still a bad guy I could root for. Perhaps it helped that I envisioned him as Anthony Hopkins. Another villain I found myself rooting for was Ishop Heer. The Diadem’s trusted trigger man continues his schemes in this novel as he tries to serve the Constellation government while simultaneously getting his revenge against those who wronged his family 700 years ago. Ishop and Laderna, his co-conspirator and lover, gleefully murder their way through a list of nobles in a personal quest for vengeance. The two characters are unquestionably crazy, but they’re also bizarrely fun. Ishop is obsessed with becoming a noble, but he’s also brutally stubborn. His desire for vengeance is only curbed by his sense of loyalty to the Diadem. Laderna is just as bent on vengeance, and they make a perfect psychotic couple. There’s a part of me that really wants their twisted relationship to work out. Beyond the myriad cast of enjoyable characters, the story really pushed some plots into new territory. For starters, the war kicks into gear with several battles, thus ratcheting up the action of the book. This is further supported by several smaller plots involving murder and treachery. Then there are the alien Xayans who finally get to spring into service and show off their telemancy powers. Everything that was built up and hinted to in the first book gets to play out in this one. The end result was a book more entertaining and fun than the first. Aside from the action, there was also a lot of juicy plot development with each side trying to out maneuver the other. The Constellation launches a large task force against Hellhole which turns into a guessing game for the reader. Will General Adolphus outsmart the enemy? Will the Constellation fleet get the drop on him? Then wheels begin spinning within wheels as other task forces are launched, factions begin fighting within each other, and a fourth party begins making it’s presence known. The Xayans have been very silent about their past and about their own factions. With the Deep Zone and the Constellation at war with each other, the last thing they need is another group showing up to add to the chaos. And yet that’s the sort complication that arises. Nothing goes to plan. I have to say, the unpredictability of the story was very enjoyable. I did not read the first book in the series. I got this one in a contest, and decided to give it a try and if I needed to read the first, I could always shelve this until I did. As it turned out, I don't think it is necessary to read the first before this one. Sure, some of the nuance may have been lost, but most of what I needed to know was recapped as the story went along. As this second book opens, Tiber Adolphus is gathering his Deep Zone allies and preparing for the coming assault from the I did not read the first book in the series. I got this one in a contest, and decided to give it a try and if I needed to read the first, I could always shelve this until I did. As it turned out, I don't think it is necessary to read the first before this one. Sure, some of the nuance may have been lost, but most of what I needed to know was recapped as the story went along. As this second book opens, Tiber Adolphus is gathering his Deep Zone allies and preparing for the coming assault from the Constellation. Adolphus and his rebels broke from the Constellation and have established their own Deep Zone alliance. The Constellation is sending a huge fleet, commanded by Escobar Hallholme, the son of the man who defeated Adolphus in the first book. The Deep Zone rebels have their own fleet, and the help of the native aliens on Hellhole, most of whom are preserved as consciousnesses in the slickwater pools on the planet. If a human chooses to enter the pools, a Xayan consciousness will meld with the human in a symbiotic relationship. There are also a few of the original Xayans still alive. The Xayans possess telemancy, which is a bit like telekinesis blended with telepathy. Sort of. The plan is to use the telemancy to assist in the defeat of the Constellation armada. But as things come to the final confrontation, a new, separate threat arrives which changes the plans of both the rebels on Hellhole, and the Xayan natives. And sets up book three. Overall, it was not a bad story. It dragged a bit in spots, and seemed a bit wordy and long-winded through the middle. The space-faring worlds are typical for the most part. The stringlines which link the planets and proved the "highways" for the ships to travel are an interesting twist on space travel. Characters are a bit typical. Adolphus is the honorable Robin Hood, leading his followers against the oppressive Constellation government. His second and lover, Sophie, is strong and competent, but still has an emotional side. The Diadem, leader of the Constellation, is scheming and politically savvy, despite her age. And her underlords are scheming and ambitious. There isn't one that stands out as really different, but all are interesting in their own way. The plot is full of intrigue, political maneuvering, and a fair bit of action. Argh, this was such a frustrating read. I really liked the first book and was looking forward to reading this sequel and seeing how "Game of Thrones - in space - with body-snatching aliens" was going to continue. But the first 150 (!!) pages of this book was just a very slow and tedious recap of the first book. I understand, and can even sometimes appreciate, the need to reintroduce the reader to characters, settings, etc, but there is no way this should last more than a chapter or so (and in a w Argh, this was such a frustrating read. I really liked the first book and was looking forward to reading this sequel and seeing how "Game of Thrones - in space - with body-snatching aliens" was going to continue. But the first 150 (!!) pages of this book was just a very slow and tedious recap of the first book. I understand, and can even sometimes appreciate, the need to reintroduce the reader to characters, settings, etc, but there is no way this should last more than a chapter or so (and in a well written novel it doesn't even present itself as a recap/reintro). In this case however it just went on and on and on, to the point it became a little ridiculous. At the same time the plot was going nowhere slowly, so it just seemed like a lot of unnecessary filler. It almost seemed like they needed a third book to make it a trilogy (because for some reason trilogies are more attractive these days than duologies), but didn't really have enough story so they just padded the middle to draw it out. Which, if that's the case, itself is unnecessary, because the book is 500+ pages and would still have been a solid novel with 100 pages less. On the other hand, the last 200 really picked up and felt like the first novel again. Things got going and I felt I got what I came for. So much so that I'm going to read the next book and am looking forward to it. But in these last 200 pages there were some sequences that went by a bit quickly and some of the first 150 pages could have been cut to give room for there to be shown more of what was happening at the end (view spoiler)[ like the scene where Ishop finally announces to the council that he is a noble. I was so looking forward to that, but it was over almost before it started. Which of course reflects the situation, but was still incredibly anti-climactic and felt stunted. (hide spoiler)]. This book was complete trash. I have never seen so many flaws in logic in a science fiction novel before, and I read a lot of science fiction. The rebels blew out hubs 3 and 4 on the Hallholme line and after the troops from Sonjeera make it back to where hub 4 was they search in vain for a iperion string from hub 4 to hub 5, but are magically able to send a message packet from the now extinct hub 4, back to the extinct hub 3. The second in command on the sonjeera fleet just happens to have a ship This book was complete trash. I have never seen so many flaws in logic in a science fiction novel before, and I read a lot of science fiction. The rebels blew out hubs 3 and 4 on the Hallholme line and after the troops from Sonjeera make it back to where hub 4 was they search in vain for a iperion string from hub 4 to hub 5, but are magically able to send a message packet from the now extinct hub 4, back to the extinct hub 3. The second in command on the sonjeera fleet just happens to have a ship full of iperion, (never mind that it's the most expensive substance in the universe, and is an that is only used by the sonjeeran government because of it's one use, or the fact that it is the rarest substance in the universe), that he uses to make a new stringline to Hallholme. Next we have an alien race that uses something called telemancy, (and do they use it, over and over and over, when we are in the chapters that deal with this alien race, or even speak of it, the word telemancy is used in every paragraph,-sometimes up to 3 times in a paragraph), it's ok when they use it on Hallholme, but when they use it on Candella, not one, but two planet busting sized asteroids destroy Candella- because hey, well I guess the retards that wrote this novel believe in not just overkill, but massive overkill. The people of Candella of course DO NOT do anything to divert the asteroids, but instead let them lay waste to the planet with no interference. Exiled General Tiber Adolphus is now unofficially in charge of protecting the 54 planets of the Deep Zone, a stretch of universe where rebels and undesirables are sent by the corrupt government of the 20 Crown Jewel worlds. Sent away by the brutal Diadem Michella in the first book, Adolphus has allied with a strange alien race who are currently coming "back to life" through volunteer human hosts on the planet Hallholme (a.k.a. Hellhole). Michella's spies have caught wind of Adolphus' growing powe Exiled General Tiber Adolphus is now unofficially in charge of protecting the 54 planets of the Deep Zone, a stretch of universe where rebels and undesirables are sent by the corrupt government of the 20 Crown Jewel worlds. Sent away by the brutal Diadem Michella in the first book, Adolphus has allied with a strange alien race who are currently coming "back to life" through volunteer human hosts on the planet Hallholme (a.k.a. Hellhole). Michella's spies have caught wind of Adolphus' growing power. She sends a hundred warships to stop him, only to once again have underestimated the General. When her massive fleet goes missing, Michella brings a famed war hero out of retirement to get her out of this mess. Meanwhile, Adolphus' alien allies, the Xayans, are becoming more powerful with each passing day and with each new human convert. Their psychic powers manage to cause major damage to Michella's homeworld of Sonjeera, turning the corrupt queen into an even more bloodthirsty tyrant. This second book in Herbert and Anderson's epic scifi saga is full of ingenious battle tactics, endless political and social intrigue, and focuses on space survival in the face of war with little-to-no supplies. Everything ends on a wicked cliffhanger, and the threat of a new enemy should provide much material for book three. Like most series of this size, there are many characters, but the authors keep things tight and we're never lost despite so much going on. "Hellhole Awakening" is the second in the Hellhole Trilogy and it furthers the story along. I would have rated this series higher if I had not read "The Saga of Seven Suns" first. The plot is so similar I suspect some reuse of ideas by Anderson. The story: a large part of the Constellation Fleet is sent against General Adolphus but he has a plan. I can't tell you what happens because a large part of the book revolves around what happened. Suffice it to say that it was gross... and reasonable for "Hellhole Awakening" is the second in the Hellhole Trilogy and it furthers the story along. I would have rated this series higher if I had not read "The Saga of Seven Suns" first. The plot is so similar I suspect some reuse of ideas by Anderson. The story: a large part of the Constellation Fleet is sent against General Adolphus but he has a plan. I can't tell you what happens because a large part of the book revolves around what happened. Suffice it to say that it was gross... and reasonable for a war situation. More and more this series has the look and feel of Saga of the Seven Suns series by Kevin J. Anderson, the co-author of the Hellhole series. Is that a good thing? Yes and no. Yes, because the Saga was a good series if a little offbeat. No, because I get reminders of it when I read THIS series... which is a little offbeat as well. If you haven't read "The Saga of the Seven Suns" series, then the Hellhole series ought to read a lot better for you. Let me start with the bad. The plot holes in this book kill it for me. Let me give you an example, (Very mild spoiler) there is an asteroid heading to a planet, this planet has multiple battleships capable of faster than light travel around it yet the idea of deflecting them is never mentioned, surely they could have at least tried to move it, I assume it'd be a pretty normal and easy task, but they never do try it. Then there's the resources, each faction seems to have very convenient numbers th Let me start with the bad. Then there's the resources, each faction seems to have very convenient numbers that seemingly come out of nowhere, Adolphus in particular seems to be able to generate ships out of thin air. As for the characters, I'm fairly meh on them, there are some good ones, Ishop Heer is the standout to my mind but in general it seems all the character development happened during the initial rebellion, which now that I think of it is weird, that would have made a better book than this, the portrayal of a Diadem turning from strong leader into a tyrant, Adolphus from a loyal recruit to a vengeful son, Hallholme growing resentful from having to compromise his honour again and again. I wonder why they didn't go with that? It would've worked so much nicer. I always enjoy the collaborations of Brian Herbert and Kevin J. Anderson and Hellhole Awakening is no exception. Really, I'm not entirely sure what to review here since this is #2 in a series and, by this point, you've made up your mind one way or another about the series. Generally, these tend to be great stories that span star systems. The characters are mostly credible, but tend not to change over the course of the narrative -- the good guys are clearly good, the bad guys relish their evil (t I always enjoy the collaborations of Brian Herbert and Kevin J. Anderson and Hellhole Awakening is no exception. Really, I'm not entirely sure what to review here since this is #2 in a series and, by this point, you've made up your mind one way or another about the series. Generally, these tend to be great stories that span star systems. The characters are mostly credible, but tend not to change over the course of the narrative -- the good guys are clearly good, the bad guys relish their evil (though, of course, they don't see themselves that way). In book 2, we do get a smattering of character internal conflict -- a couple of characters work for the bad guys are are beginning to rethink it. And we learn that the conflict is not just between two factions of humanity (David and Goliath), but also between two factions of alien, with our intrepid heroes caught in the middle. I know that Ray Bradbury was right when he said that we should always read books even the bad ones, because it's important to read, but this book killed me. The first one was alright. It wasn't great, but it was okay. So I saw this book at the library and thought I'd try reading it since I had read the first one and see if it was better. It was not. Hellhole Awakening has to be one of the worst books I have ever read and I read an incredibly dry and droning book on String Theory that nearly put I know that Ray Bradbury was right when he said that we should always read books even the bad ones, because it's important to read, but this book killed me. The first one was alright. It wasn't great, but it was okay. So I saw this book at the library and thought I'd try reading it since I had read the first one and see if it was better. It was not. Hellhole Awakening has to be one of the worst books I have ever read and I read an incredibly dry and droning book on String Theory that nearly put me to sleep. That book was better than this one. This book almost put me in a coma. The second book in Brian Herbert and Kevin J. Anderson’s original Hellhole trilogy is very consistent with the first book. Taking place immediately after the first book ends, the authors build upon both the characters and situations, creating a more action packed second book, with considerably more deaths and political deceit. If you enjoyed the first book, you will no doubt have a good time with this one. And while certain secrets are revealed that were quite predictable, it was still a fun rid The second book in Brian Herbert and Kevin J. Anderson’s original Hellhole trilogy is very consistent with the first book. Taking place immediately after the first book ends, the authors build upon both the characters and situations, creating a more action packed second book, with considerably more deaths and political deceit. If you enjoyed the first book, you will no doubt have a good time with this one. And while certain secrets are revealed that were quite predictable, it was still a fun ride and I look forward to finishing the series with the last book in the trilogy, Hellhole: Inferno. If you did not read the first book, I would advise not to start with this one, but to read from the beginning. However, with the quick back story the authors smoothly deliver, it should not be too hard to catch on to the story. They do a nice job of not treading over old ground for too long before moving forward with the adventure. Although I prefer the authors’ work on Dune, for a large-scale, easy to read space opera, this series still hits the mark. There are not many writers who do space sagas better than Kevin Anderson (i know the Goodreads lists shows Brian Herbert as the lead author but trust me, KJA had to be the strong hand here). This series is no exception, with plenty of space battles, political intrigue, action and aliens. The reason I gave it three stars is not because it is lacking in the elements that make this type of book entertaining, rather it just doesn't break any new ground nor does it give me a sense of wow. I suspect t There are not many writers who do space sagas better than Kevin Anderson (i know the Goodreads lists shows Brian Herbert as the lead author but trust me, KJA had to be the strong hand here). This series is no exception, with plenty of space battles, political intrigue, action and aliens. The reason I gave it three stars is not because it is lacking in the elements that make this type of book entertaining, rather it just doesn't break any new ground nor does it give me a sense of wow. I suspect that I have read so many of these kinds of stories that they all kind of run together and are just that, space action dramas. Call it burnout if you will. I think it's important that you come to the Hellhole trilogy with certain expectations. I'm not used to the style of writing Kevin J. Anderson and Brian Herbert did on this trilogy, so I ended up feeling the first novel was kind of slow, with promise of a lot more to come in the sequels. And even though that is true for Hellhole: Awakening, I finally came to the understanding that this series is not an "action packed" story. The Hellhole trilogy, in my opinion, can be best described as a politica I think it's important that you come to the Hellhole trilogy with certain expectations. I'm not used to the style of writing Kevin J. Anderson and Brian Herbert did on this trilogy, so I ended up feeling the first novel was kind of slow, with promise of a lot more to come in the sequels. And even though that is true for Hellhole: Awakening, I finally came to the understanding that this series is not an "action packed" story. The Hellhole trilogy, in my opinion, can be best described as a political science fiction series that doesn't really deal with action (gun fights, ship battles, etc, etc) the way a lot of other stories do, because those things aren't what this series is focusing on. The Hellhole trilogy focuses on politics of the conflict more than the conflict itself. In general, the rebels are more complex characters whereas the Constellation nobels are one-dimensional ("hit hard hit fast" is their military model and reflects their basic approach to life). No character has the complexity of George Martin's Fire and Ice series. Also, the plot developments can almost always be predicted: any time a character on either side is confident then that character's plans are disrupted. It got annoying fast. In addition, a suggestion regarding irony: it needs to be dishe In general, the rebels are more complex characters whereas the Constellation nobels are one-dimensional ("hit hard hit fast" is their military model and reflects their basic approach to life). No character has the complexity of George Martin's Fire and Ice series. In addition, a suggestion regarding irony: it needs to be dished out sparingly to be interesting and not cloying (cloying irony? now that's...). The Xayan's are the major unpredictable element: whether it is their mysterious enemy, the extent or consequence of their telemancy or if there dream goal is actually a good thing. Because of them, this moved from 2 to 3 stars and I debated giving 4 stars. I wish the focus of the book was more on them and let the silly Constellation be a side issue that pops up rarely. I'm ok with cliffhangers, but not finishing any major storylines (and there were several), only bringing minor episodes to a close, is just annoying. Hellhole: Awakening borrows from the creativity of the first book Hellhole, and brings us a repetitive tale that, basically, takes us nowhere. Most of the "big" revelations were pretty obvious and any attentive reader would have figured them out a few chapters before. If you are dying to know what happened next after the previous book, AND you can fi I'm ok with cliffhangers, but not finishing any major storylines (and there were several), only bringing minor episodes to a close, is just annoying. If you are dying to know what happened next after the previous book, AND you can find this one in the bargain bin, go ahead and read it. It is readable, and absolutely not one of the worse books I ever read. But if you are expecting something worthy of the "son of Frank Herbert" and Kevin J. Anderson, you are going to be disappointed. This review has been hidden because it contains spoilers. To view it, click here. I liked the novel, it was not too surprising. The hints about what was going on made the revelations at the end of the novel less surprising. However the one on the last page got my attention as I was not expecting it. I did not like the decisions the Diadems strong right hand made. After she betrayed his noble ambitions I was expecting him to behave differently towards her Lady enemy. I thought most of the other characters made sense but Ishop Heer disappointed me. There were some character de I liked the novel, it was not too surprising. The hints about what was going on made the revelations at the end of the novel less surprising. However the one on the last page got my attention as I was not expecting it. I read this without reading Hellhole. Colonial planets fight for independence. I had no problem following the plot, even though I didn't read the first book. There are many repetitive passages; each shift to certain characters involves an introduction as if we had never before met the character. There are other minor repetitions and it gets worse as the book grows longer. With these exceptions, all the words have a purpose beyond adding length; there are few extraneous details or sub-plots. The en I read this without reading Hellhole. I had no problem following the plot, even though I didn't read the first book. There are many repetitive passages; each shift to certain characters involves an introduction as if we had never before met the character. There are other minor repetitions and it gets worse as the book grows longer. With these exceptions, all the words have a purpose beyond adding length; there are few extraneous details or sub-plots. The ending is inconclusive as if leaving the opening for another book. It's hard to know where they'll be going with this next . . . I'm not a spoiler, so I'm not going to tell you what happened . . . read the description for a sense of the story. Brian and Kevin weave some intricate plots and they sure threw in a few big twists . . . sometimes, I worry they get so complicated there's no way to easily resolve all the story-lines in a satisfying manner. Nonetheless, they have my attention and I'll read the next one, and the next one, etc., until they decide to end th It's hard to know where they'll be going with this next . . . I'm not a spoiler, so I'm not going to tell you what happened . . . read the description for a sense of the story. Brian and Kevin weave some intricate plots and they sure threw in a few big twists . . . sometimes, I worry they get so complicated there's no way to easily resolve all the story-lines in a satisfying manner. "Hellhole Awakening" is the second book in Kevin J. Anderson and Brian Herbert's "Hellhole" series, a space opera about a rebel general and his attempt to form a breakaway confederation of planets in opposition to an evil empire. This novel shows Anderson's great plotting ability. He skillfully weaves a number of subplots, layers of narrative, plot twists, and reverses, to create an engaging story. I would have to give this book a cleanness rating of only three stars out of five. 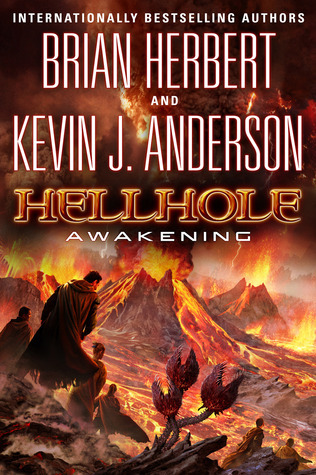 There's some prof "Hellhole Awakening" is the second book in Kevin J. Anderson and Brian Herbert's "Hellhole" series, a space opera about a rebel general and his attempt to form a breakaway confederation of planets in opposition to an evil empire. I would have to give this book a cleanness rating of only three stars out of five. There's some profanity, not a lot, but the story does include a fair amount of gruesome violence.